Lots happening behind the scenes in the Soundroom lately: multiple Listening Salons (the full setlists of which are soon forthcoming); closing in on a new studio space; meeting Pandit Ravi Shankar for the first time; so much hot music on the hi-fi of late. Irja, my dear Estonian friend, has commented in the past, not without a note of appreciation, “You make Spooky Music!” She has heard Past Andromeda, Fata Morgana, and other more cinematic works. Though “spookiness” is rarely my intent, that Past Andromeda has been interpreted as such by a dear and trusted friend makes its Halloween album release date a fortuitous coincidence. 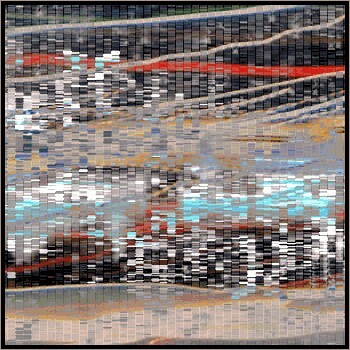 The hard working folks at the web-based record label, Stasisfield.com, have focused on making its release a success. 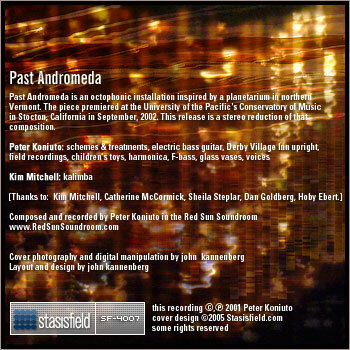 Past Andromeda is currently available as a free download from the Stasisfield website, along with the lovely album artwork designed by John Kannenberg. This is a true win-win situation. What an honor to be invited into the inimitable Stasisfield community! I encourage all to have walk about, take a gander at the other releases proffered by this unique record label. The Red Sun Soundroom – Stasisfield alliance promises much for the future.